UPDATE: Apple iPad on sale in Best Buy, PC World and Currys this Friday | What Hi-Fi? The Apple iPad will be available in 139 PC World and Currys stores as well as Best Buy's new store in Thurrock, Essex when it goes on sale this Friday, May 28th. According to The Times, PC World and Currys parent company DSGi has been given a 60-day start to sell the iPad ahead of its rivals. DSGi already has 52 Apple concessions in its store. Apple has 27 of its own stores in the UK, and you can already pre-order the device on the Apple website. Alternatively, you'll be able to buy an iPad at your local Apple store, which will open early at 8am on Friday. After a series of delays, Apple has confirmed the iPad will go on sale in the UK, and eight other countries, on May 28th. Australia, Canada, France, Germany, Italy, Japan, Spain, Switzerland and the UK will see the Apple iPad go on sale on the same date. Customers can pre-order all iPad models from Apple's online store in all nine countries beginning on Monday, May 10. The iBooks app for iPad including Apple's iBookstore will be available as a free download from the App Store on the launch date. iPad is available in the UK for a suggested retail price of £429 for 16GB, £499 for 32GB, £599 for 64GB for Wi-Fi models and £529 for 16GB, £599 for 32GB and £699 for 64GB for Wi-Fi + 3G models. In the US, Apple has already sold over one million iPads and customers have downloaded over 12 million apps from the App Store, as well as over 1.5 million ebooks from the new iBookstore. Apple has postponed the international launch of the iPad due to 'surprisingly large demand' in the US. It will now reach the UK, and beyond, some time in late May. The extra month delay means international pricing will be announced and online pre-orders will begin on Monday, May 10. Today mobile operators O2, Orange and Vodafone confirmed they will offer the iPad in the UK, with iPad price plans for all models available "from the end of May". This suggests that the 3G version of the iPad – which offers mobile data connection in addition to the wi-fi-only connectivity of models currently on sale in the US – will arrive in the UK at the same time as the cheaper wi-fi version. The Apple statement said: "Although we have delivered more than 500,000 iPads during its first week, demand is far higher than we predicted and will likely continue to exceed our supply over the next several weeks... We have also taken a large number of pre-orders for iPad 3G." It's clear Apple is eager to point towards the "runaway success" of the iPad in the US as evidence for the dela, though could there be anything else at play? We'll have a review of the Apple iPad in the June issue of the magazine, out on May 6th. The Apple iPad release date has changed a fair few times now but with a date confirmed for the US release – April 3rd – the latest, albeit vague, announcement of 'late April' seems final. 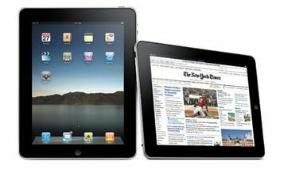 Eager US Apple devotees can pre-order the iPad in either of its two incarnations from Monday March 12th. The Wi-Fi model will then hit US stores on April 3rd, with the Wi-Fi and 3G model set to follow in 'late April', which is also when the UK and the rest of the world will get their hands on the iPad. If, unlike the majority of interested parties, you're all set to splash the cash on Apple's new iPad as soon as it's available in the UK, you'll be pleased to know your wait has been cut to a month or so. Originally scheduled to hit the UK in June or even July, Apple has now announced that Wi-Fi models of the iPad will be available in late March. Apple's UK store also confirms that 3G models will then come to Blighty in April. Pricing and network deals are still to be announced but we'd imagine that could be cleared up any day in light of the confirmed shipping dates. Read the news as it broke below, or head over to our Apple iPad blog for more pictures and information. See our special Apple iPad blog for loads more pictures of the device in action. Jobs is rounding up now. "Our most advanced technology in a magical revolutionary device at an unbelievable price." "Do we have what it takes to establish a third category of product, between a laptop and a smartphone? There's a pretty high bar... but we think we've got the goods. We think we've done it." So that's it. No new iPods or iPhone, all eyes on the iPad. Let us know what you think in the Comments box below. We'll report back tomorrow when our man in San Fran has had a chance to play with it, and hopefully bring you some more pictures. We're being treated to a video now. The iPad looks very slick – the user interface is amazing – and the pricing, at least in the US, is keen enough to make it work. But it doesn't quite live up to the pre-show hype. The multitouch screen has more than 1000 sensors for precise control. The screen has LED backlighting and the same IPS screen technology as the iMac. So much for OLED - presumably too expensive. And there's no camera either. Here we go, prices: iPad starts at $499 (16GB), $599 (32GB), $699 (64GB) for the wi-fi models, but add $130 for 3G. Available in 60 days worldwide for wi-fi models, 30 days later for 3G. Mmm, will that mean prices from £500 in the UK? Keyboard dock available too. International data deals done by June, July. All iPad 3Gs are unlocked and use standard GSM micro SIMS. iWorks apps are $9.99 each. Soft keyboards are context sensitive – so you get a nice big numeric keypad, or a date-specific keypad. iPad syncs over USB with iTunes like an iPod Touch. Every iPad has wi-fi, but some have 3G too. iPad data plans in the US: 250MB per month for $14.99; unlimited for $29.99. AT&T is providing the data plan in the US. Next up Phil Schiller on iWork. Yawn. No mention yet of 3G access, price, camera or video conferencing. iBooks app looks as slick as you'd expect - it uses the ePub open book format and has lovely page turning animations. But still, your eyes will start burning after a while. Looks like Apple will charge between $8-$15 for a book from the iBooks store. Ah, iBooks software with iBooks store. Nice library-style interface. Now it gets interesting. iPad is being positioned as an e-reader. Apple has already done deals with Harper Collins, Penguin, Simon & Schuster. Next up Electronic Arts, who will show off some iPad games. Need for Speed looks pretty good - you use the whole pad as a steering wheel. Martin Nisenholtz from the New York Times takes to the stage. The paper has developed an application for the iPad in the last three weeks that's a rough facsimile of the newspaper itself, but navigable more like a website. Video can play inline, but we don't know yet if it will support Flash. Our man reckons that so far the iPad looks much like an overgrown iPod Touch - we don't yet know if it has 3G or any other hidden features. Could be good for games though with that bigger screen. Jobs is replaced on stage by Scott Forstall, who runs Apple's iPhone Apps division. When you buy your new iPad, it will synchronise your existing iPhone apps, which can be upscaled to fit the 9.7in screen. Also one month of standby battery life. Nice. iPad can run virtually every app on the existing iTunes store. Either centred or upscaled. Here come the tech specs: 0.5in thick, weighs 0.7 kilos, 9.7in multitouch display, 1GHz Apple A4 chip, between 16GB and 64GB of flash memory. Plus Bluetooth, 802.11n wi-fi, 10-hour battery life for watching video. Jobs shows how the iPad can browse the web, handle email, view maps, access iTunes. And it's called... the iPad. It's smaller and squarer than most of the mock-ups we've seen, more like a big iPhone. You can watch YouTube, TV shows and movies. There are plenty of other apps too: photos, calendar, Google maps, iTunes, music. The browser, says Jobs, is "way better than a laptop, way better than a smartphone". He reckons there's a space between mobile phones and laptops - something for browsing email, photos, video, music, gaming, reading. "Netbooks aren't better for anything," he says. Steve Jobs arrives on stage. He starts with a tease: "We want to kick off 2010 with a magical, truly revolutionary product today. But first I have some updates." And we're off. The journalists are seated and the show's about to begin. Our roving reporter is queuing outside the Yerba Buena Centre, waiting to get in. Let's hope he doesn't get turned away! There's just an hour to go before the start of Apple's much-hyped press launch at the Yerba Buena Centre for the Arts in San Francisco. We'll have the inside track on what's happening as colleagues from our sister site Stuff.TV – the only UK magazine to be at the event – will be blogging live from the event as soon as it begins at 6pm GMT. We'll bring you up-to-the minute reports here on whathifi.com as soon as the news starts to break. There's been a huge amount of speculation about what Steve Jobs will announce tonight: we could see new iPods and iPhones, but the main focus is on the so-called Apple tablet or iSlate. Will it be Apple's answer to the e-reader, with a new books section on iTunes? Will it have a built-in TV tuner and PVR? How much will it cost? The rumours are flying, but we'll be able to sort fact from fiction very shortly. So remember to keep following us here on whathifi.com, or Twitter. We'll bring you regular updates throughout the evening.